These crispy butter toffee peanuts give your sweet-salty tastebuds the ultimate thrill—satisfying all your cravings while leaving you smitten and spoiled for anything less. Only the largest, crunchiest Virginia peanuts make the cut for this sweet, buttery treat, so give or serve them with pride, and be sure to hide a tin for yourself. 11.5 oz. Love toffee and peanuts, and this combinations is irresistible. They were very good and tasty.My Grandchildren loved them and ate all of it. They wanted me to buy more than one can next time. I purchased these peanuts as a gift and have not received any feedback about them. I may order them for myself just try them out. They sound yummy and something I would like. 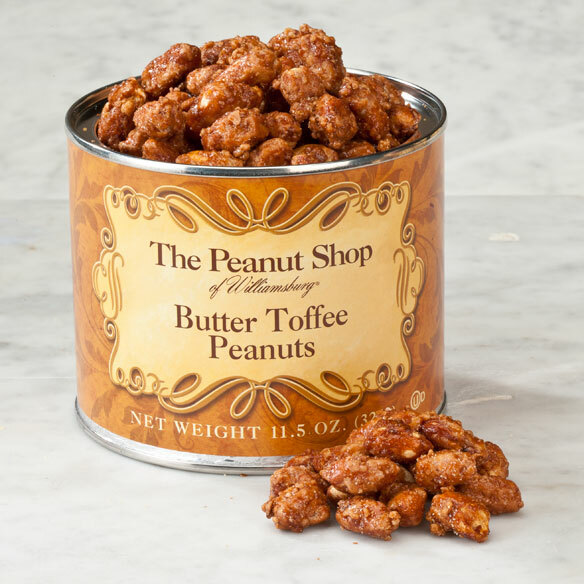 I love Butter Toffee Peanuts. Hope these are good.